Raise a glass of cheap swill to celebrate the memory of Edward "Old Grog" Vernon, born November 12, 1684. It is perhaps doubly insulting to the grand and venerable Admiral Edward Vernon that his nickname “Old Grog” should come from the material of the coat he wore (grogram) and that his military legacy should be the concoction of cheap and diluted spirits to sober up the seamen who loathed him. 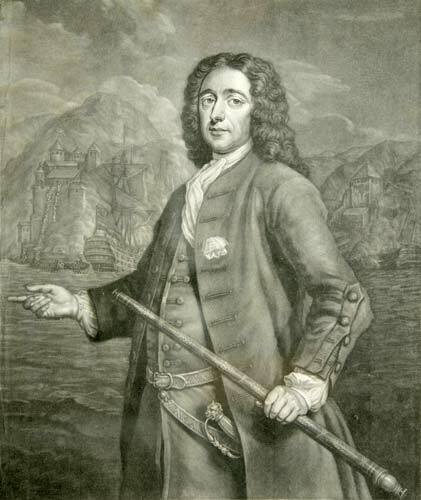 Edward Vernon was born in 1684 in Westminster, England, and rose quickly through the ranks of the British Royal Navy, achieving the rank of captain by the age of twenty-two. In his other role as a Parliamentarian, he famously argued in favor of retaliation against Spain in the case of Robert Jenkins, a British mariner whose ear was cut off by a Spanish commander in 1731, leading to the—honestly—War of Jenkins’ Ear waged between Britain and Spain in 1739. Vernon was eventually promoted to Vice Admiral and was somewhat conspicuously detested by the majority of the sailors who served under him—the notable exception of whom was George Washington’s half-brother, Lawrence, who had served under the admiral in 1741 and decided to name the family estate Mount Vernon after his commander. When strutting gallantly across the sea-swept decks, Vernon’s preferred outerwear was grogram, a coarse and all-weather weave of silk, wool, and mohair often stiffened with gum. John Ciardi* relates that Vernon further waterproofed his cloak with pitch and beeswax, which rendered it so stiff in the cold that both the grogram and the salty admiral had to be warmed by a stove to soften them—leading to the nickname of Old Grog. What Vernon’s grumbling sailors did not realize at the time was that the occasional addition of citrus juice for flavor was giving them the extra vitamin C they needed to avoid scurvy, and, seven years later, James Lind formally proved the efficacy of citrus to curb the disease. The British Royal Navy eventually mandated a daily dose of what would become Rose’s Lime Juice, the bitter flavor of which was eventually improved with the addition of gin (see gimlet). Old Grog himself died in 1757, but his name lives on in word and song. It’s all for me beer and tobacco. *Good Words to You, Harper and Row, 1982.